Despite the natural volcanic beauty of Dominica, this is one of the least developed Caribbean islands. The best places to stay in Dominica are a charming collection of smaller resorts and guest-houses surrounded by lush forests. Dominica is the largest of the Windward Islands. It is green, fertile and rich with exotic plants and animals. Dominica sits between the Caribbean Sea and the North Atlantic Ocean. Most of Dominica's sand is dark and volcanic with just a few beaches of that white, traditionally Caribbean stuff. As a result the typical Caribbean tourists have largely ignored this beautiful, vibrant island. Dominica is home to excellent diving centres. One of the most famous diving and snorkelling sites is Champagne, on the southern coast, where volcanic vents emit continuous streams of bubbles. The southern coastline of the island is great for whale watching. Dominica's rugged, mountainous interior also attracts hikers and explorers - there is an excellent cross-island trail through the mountains. These mountains are mostly volcanic cones and up here amongst the lava caters you'll also find Boiling Lake, the world's second largest thermally active pool. In the hills above Roseau, the capital, you will find some really charming island hideaways, which make a great base for hikers and explorers. While English is the official language, many Dominicans speak French Creole as a first language, so there is a French Caribbean feel to the place with strong links to Martinique and Guadeloupe - which lie on either side. Whether you are scaling the lofty peaks or exploring the stunning coastline, this island's greatest asset is the stunning natural landscape and the best places to stay in Dominica serve to accentuate these amazing surroundings. The Zandoli Inn is a wonderfully secluded, five room hideaway set on a 111 foot cliff with views overlooking the Atlantic. As well as the sea view you are surrounded by six acres of lush gardens. The small restaurant serves Dominican cuisine. Secret Bay is a "Robinson Crusoe" paradise offering barefoot luxury with breathtaking seaviews. 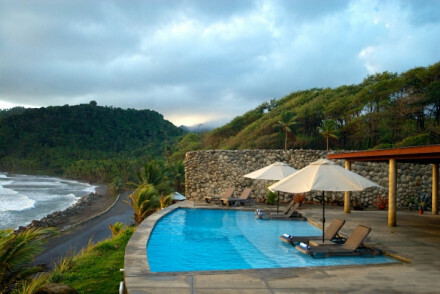 It is definitely one of the best places to stay in Dominica if you're planning to come here on honeymoon. 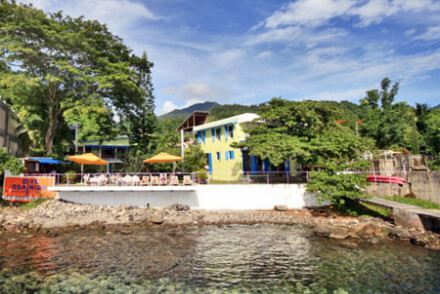 Castle Comfort Dive Lodge is ideally located on the waterfront and is surrounded by many of Dominica's best dive sites. It is a chilled out guesthouse offering superb value for money with rooms starting from as little as £52 per night. Pagua Bay offers hillside accommodation in four smart cabanas and two suites. The ocean views are superb and it boasts a great restaurant. If your looking for your own private apartment, we recommend you visit our online partner Booking.com. Dominica is home to two regional airports: Douglas-Charles Airport and Canefield Airport that are connected to places like Puerto Rico, San Juan and Martinique. 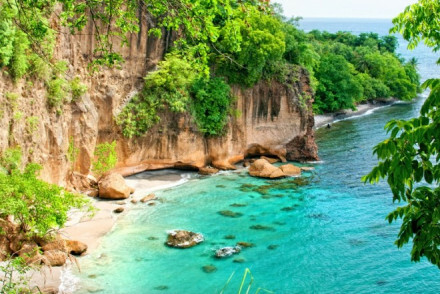 The best time to visit Dominica is from January to April, when temperatures range from 21 to 28 degrees cekcius. The summer is punctuated by the hurricane season which runs from June to October, and this is when the island receives most of its rainfall. If you wish to hire a car to see more of the Dominica, we recommend you visit our partner, Rentalcars. 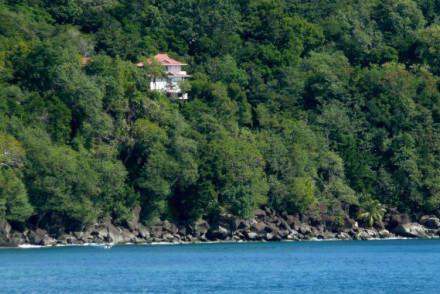 Browse through our list of all the best places to stay on Dominica. A traditional Caribbean guesthouse on the water front surrounded by some of the best diving spots, waterfalls, national parks, and whale and dolphin safaris. Fantastic sea views, traditional accommodation, and a simple restaurant. Fantastic value for a back to nature experience. Great walks - Hikes to lakes, rivers or waterfalls, heritage tours to the Kalinago Territory. Diving - Diving is the main attraction. Charming inn with outstanding views. The rooms are in colonial-chic style with shuttered windows, canopy beds and balconies. Outdoor pool, six acres of gardens. Excellent Dominican cuisine, small bar area. A perfect Caribbean hideaway. An intimate boutique hillside property, with six romantic cabanas. Contemporary chic interiors, private balconies, and all the mod cons. An excellent Caribbean and fusion restaurant, lovely bar, pool, and endless ocean views. Totally relaxing, barefoot luxury, not overstated. A Robinson Crusoe paradise. Barefoot luxury, panoramic sea views, a private beach, private pool on your balcony, fully stocked kitchen and personal chef. Each bungalow up in the rock face and surrounded by tropical plants. Diving, snorkelling, yoga, reading. The ultimate honeymoon. Honeymoons - A Robinson Crusoe paradise.